are reproduced from original wood engravings by Greg Lago of Clayton, New York. up from paper, out of ink, into the inner eye. the way they would emerge from morning haze. as those you almost recognize in dreams. tinted now as a drop of ink will stain a quart of wash.
aflicker, across a fire in the dark. 40s jazz ripples out from pine-hidden patios. Mist breeds over Croil Island shallows. The boat turns slowly on its anchorline. with smuggled Canadian beef and beer. mingled in washed-out roots of apple stumps. The past outlasts us. The land changes. in the lightly bobbing boat. Dale Hobson writes in and about the Adirondack North Country of New York State. As web manager at North Country Public Radio he created and edits Books by Email, a serial presentation of complete new and forthcoming books by authors of the region. He hosts an occasional broadcast/podcast feature “Giving Voice,” showcasing poets in performance and interview, is an occasional co-host of Readers & Writers on the Air, a monthly call-in on contemporary literature, and writes a weekly column for the NCPR newsletter The Listening Post. Previous publications include the chapbooks Nickelodeon, Second Growth and The Water I Carry. 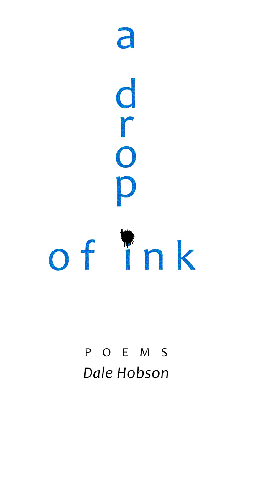 A Drop of Ink is his first full-length collection of poetry. He shares a home on Sugar Island Flow in Potsdam, New York with his wife, Terry de la Vega. a drop of ink is an 80 page hand-stitched paper book with spine - $16.00.